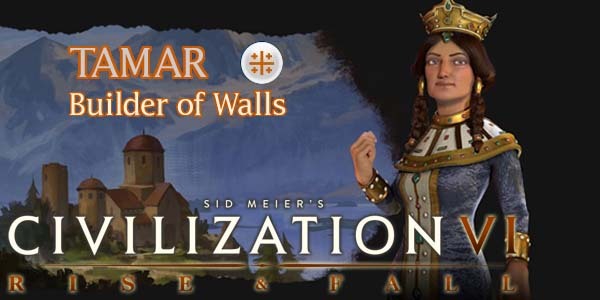 Civilization VI's first expansion, Rise & Fall released a couple months ago, and it introduced a few leaders and civilizations that are making their first appearance in the franchise. I hope to be able to write strategies for every one of the expansion civs and leaders, but I'm going to start with the ones that are new to the franchise, and the ones that most utilize the expansion's new features (Era Score, governors, loyalty, and so on). 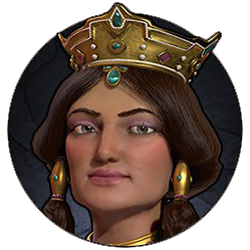 The first civilization that I will tackle will be the Georgian civilization, lead by Queen Tamar. The feuding Georgian kingdoms in the Caucusus were first united under Bagrat III between 1008 and 1010 AD, after he tricked his cousins (the heads of feuding houses) into a false reconciliatory meeting, only to throw them into prison and ensure that his son would become heir to the kingdom. A few years later, however, that son would become a prisoner of the Byzantines as part of a peace deal after Bagrat's failed attempt to reclaim the ancestral city of Tao from the Eastern Roman Empire. The Georgian empire reached its height under the rules of King David IV and Queen Tamar in the 12th and 13th centuries. These monarchs took advantage of the decline in Byzantine power and filled the power vacuum by claiming lands lost by the Byzantines. During this time, art and literature flourished, and Georgia developed its own architectural styles. Ecclesiastic art was dominant, but this period also saw some of the first major secular works of art and literature. This period would eventually become known as the Georgian Renaissance (or "Eastern Renaissance"). The renaissance continued under Tamar's rule, who proved adept at statecraft. She mediated internal tensions within her kingdom, and even thwarted a coup by her Russian husband, all the while protecting her kingdom from Turkish invasions and claiming Muslim lands to the east and south. The Kingdom of Georgia's golden age would eventually come to an end at the hands of invading Mongols in the 13th century. The kingdom would be fractured, and the ensuing Black Death would ensure that Georgia would never again reach its former glory. In Civilization VI: Rise & Fall, Georgia is a defensive and religious civilization that thrives in its golden ages. Tamar is a bit of a religious world policewoman who builds strong relationships with city states that share her faith, and who will aggressively protect her city state allies.